Not many yoga centers in KL hold kids yoga classes currently. Actually some parents may not know that kids from ages 3 to 12 years old can learn yoga too. I only got to know about kids yoga classes when my yoga centre started offering the classes last two months. I had paid a visit to the Kids Yoga class as I was curious what type of yoga they are their actually practicing. Surprisingly, the kids are doing poses similar to adults. They also do warm-up at the beginning before starting the actual yoga. However, the yoga they practice is mostly is a mixed version which involved a bit of hatha yoga, vinyasa yoga, power yoga, relaxing yoga and others. It’s very interesting as it involves lots of movement. When the teacher asks them to go back to their places to start the class, the kids run back to their own yoga mat. Then warm-up started. When they were asked to do the pose, they did it very easily and fast. Their body is very flexible to perform the poses accurately and easily. Yet they show less concentration in each pose as though it was quite boring and tiring, having to hold each pose for some time. I guess that’s why kid’s yoga combine lots of yoga types which makes it more interesting. Address : Swarupa Yoga 58-2 Jalan Telawi, Bangsar Baru. I have just recently offer my shop space for the yoga instructor to conduct Kids Yoga for kids age 3 and up. My daughter is one of the participants. They really have a good time. if anyone of u interested to find a class for your kids in Subang, can call 03-8023 1617. We are located opposite Giant USJ. 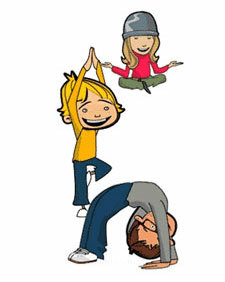 Please visit http://www.cocoonyoga.com for more info on kids yoga. Free Trial class every Sat 12:15pm tp 1pm. We are an enrichment centre based in Cheras and currently looking for a kids yoga teacher. Anyone interested please kindly drop us an email: edenlandcentre@gmail.com. Thanks! I am interested to send my daughter for Yoga lesson, she is 4 by Nov. Have you found a kid yoga instructor for Cheras yet? Where exactly is your place? Btw, anyone knows any place that conduct yoga classes for Mom and kid? Hi, my son is 4 years old. I’m looking for kid’s yoga class in Cheras or Pandan area. If you know any , kindly email to me. Hi does anyone know where is at cheras are conducting yoga class for mum and kids. please advise.